Antalya is the largest city on the Turkish Mediterranean coast, and is the hub of the so-called Turkish Riviera. Situated on coastal cliffs, Antalya is surrounded by mountains and the sea. There are few places with a more spectacular setting, and it’s no surprise that this has become one of Turkey’s most popular tourist destinations. Aside from an amazing setting, Antalya is rich in history and art. Check out the beautiful old quarter, Kaleiçi, which has narrow, winding streets enclosed in ancient city walls. It is best to enter and exit the old quarter from charming Hadrianus Gate, built by the Roman emperor Hadrianus as the entrance arch to the city. Antalya is also home to some remarkable old ancient Roman ruins. There’s Aspendos Theater, an ancient Roman theater, and a great archaeology museum with plenty of other historic buildings and ancient ruins nearby. Yivli Minaret, Karatay Medresesi, Hıdırlık Tower, Ahi Yusuf Mescidi, Iskele Mosque, Murat Paşa Mosque, Tekeli Mehmet Paşa Mosque, Balibey Mosque, Musellim Mosque, Seyh Sinan Efendi Mosque, and the Clock Tower are just some of the other historical structures you might see while taking a stroll. If history, architecture and natural beauty don’t entice you, it might be a consolation that the weather here is near perfect. Around 300 days of the year are sunny; sea temperature range between 15 °C (59 °F) and 28 °C (82 °F); air temperature can climb as high as the 40 °C (104 °F) range in July and August, with the low-to-mid 30 °C (86 °F) typical. If that sounds too hot for you, the sea breeze and the northeasterly winds help to make high temperatures more bearable. A number of film and music festivals occur here every year, and it is a vibrant cultural hotspot. And food is spectacular. Antalya’s signature cuisine includes Piyaz (made with tahini, garlic, walnuts, and boiled beans), spicy hibeş with mixed cumin and tahini, şiş köfte, tandır kebap, domates civesi, şakşuka, and various cold Mediterranean dishes with olive oil. One local speciality is tirmis, boiled seeds of the lupin, eaten as a snack. You’ll eat well here for sure. Antalya Metropolitan Municipality’s covered wholesale food market complex meets 65% of the fresh fruit and vegetable demand of Turkey. 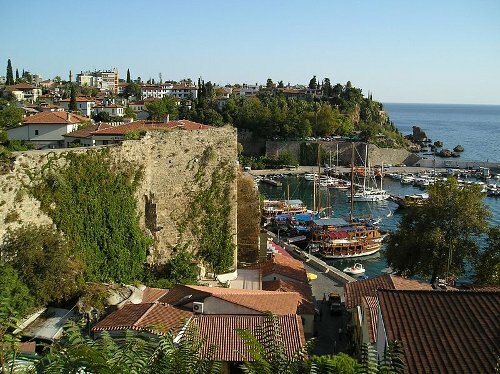 It’s easy to get in and out of Antalya since it is a large city and such a tourist attraction. If you’re here to study or teach, the city is also home to Akdeniz University. This is one location that sells itself. Tempt yourself with a visit!